until recent times it was the practice for most artists to mix their colours by hand. When he acquired some standing the Master would hand the operation over to a 10 or 12-year-old apprentice. Samuel van Hoogstraten (Dordrecht 1627 –78). Artist in his studio painting a double portrait. His apprentice in the background is mixing the artists colours on a grinding stone. Sepia watercolour. Musée du Louvre. Even today, a lot of the practices that artists adopt when mixing their colours, pigments, balsams, oils, the weighing, measuring and cooking is not unlike messing about in the kitchen a subject that, in itself, has been a common theme in European painting over the centuries. In 1950s England, inspired by John Osborne’s 1956 play Look Back in Anger, a school of expressionist painters emerged known as the Kitchen-Sink school. Dominated by John Bratby and Derrick Greaves they took as their artistic inspiration working-class urban imagery. 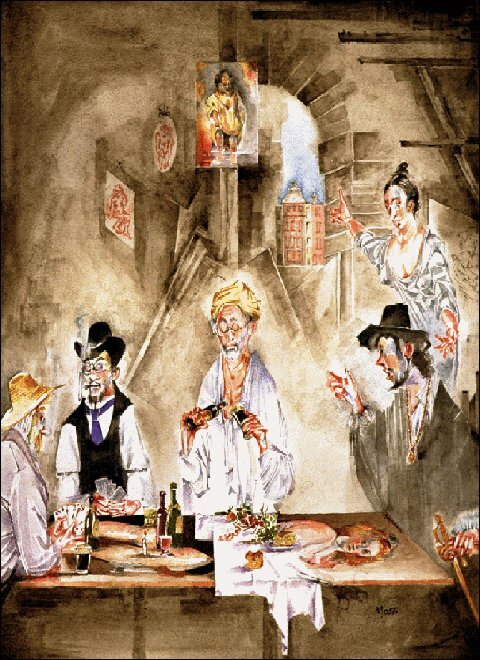 At the turn of the 20th century, a similar group of Philadelphian painters known as the Ashcan school had preceded them espousing the same proletarian philosophy. Artists had known for centuries that the materials they handled were toxic. The literature of art abounds with anecdotes of artists poisoning themselves by, for example, cutting a piece of cheese with the same knife used to cut their lead white paint. Early studies of work-related injuries beginning with the early 18th century note that the easiest ways for artists to, accidentally, kill themselves or damage their health was by handling and unintentionally absorbing powdered toxic pigments like flake white, chrome yellow or orpiment (created from arsenic and sulphur). portrait of Helen Fourment. Helen was the younger trophy wife of Rubens. Leonardo da Vinci’s great intellect and scientific curiosity was responsible for the destruction of his greatest works of art. Two masterpieces have disappeared or remain elusive fragments. One of them is the Cenacolo, 'The Last Supper’ a large mural painting in the refectory of Santa Maria delle Grazie, Milan – completed in 1498. Most mural paintings in the high Renaissance were created in fresco, which by Leonardo's day had been brought to a high degree of perfection. The technique was a development of Roman and Pompeian fresco painting. The difference was that the ancient Romans covered the wall to be painted in fresco with a massively thick layer of plaster. This would remain damp for days on end and allowed the artist to apply his colours, dry pigments mixed with water, at his leisure. The Renaissance on the other hand used much thinner strata of wet plaster forcing the painter to complete that section within the limits imposed by a working day. The plaster once dried out could not subsequently be painted on to create a fresco. Such a laborious carefully planned out manner of painting did not suit Leonardo's style. He was more used to painting at an easel where he could study what he had done, alter it or cancel and make changes, techniques not permitted in fresco painting. He therefore attempted to paint on the plaster surface using the colours he would have used when painting in the studio rather than, as fresco painting required, colours mixed only with water. He used tempera, that is, colours mixed with glue or with egg yolk, the technique of earlier Florentine painters. To get the soft luminous effects of light and shade that is a characteristic of Leonardo's work he worked over the underlying tempera colours with paints mixed with walnut oil. It was a new and risky experiment and it did not succeed. Not long after it was completed, the incompatible nature of the two paint layers began to work against each other and the paint began to flake badly. It did not help that the artist was not aware how damp the wall on which he painted was, not helped by having the kitchens of the convent immediately behind it. While historians blame Leonardo's experimental technique for the rapid deterioration of the great work of art, it is probable that the dampness of the brick wall would eventually, fresco or not, have destroyed any painting created on its surface. Leonardo da Vinci's next kitchen-sink experiment was the Florentine city council's commission, signed by Niccolò Machiavelli, for a mural painting of the Battle of Anghiari in Palazzo Vecchio’s Salone dei Cinquecento. Again, it conflicted with his working method of sketching in the design and composition, modifying it, adding and removing elements and colours as the painting proceeded. To short-circuit the complex process necessary to paint a fresco, and prioritise the feeling of spontaneity, he turned to encaustic. It is a stable and very ancient painting technique using colours mixed with hot wax. The artist applies the colours with bushes, but the colour is more usefully worked into the surface using metal spatulas while it is still hot and malleable. Encaustic may have formed part of ancient Pompeian artist's fresco painting technique. The technique was used mostly for easel paintings in Roman-era Egypt and in Greek paleo-Christian panel paintings. Nineteenth century artists experimenting new and ancient techniques rediscovered encaustic and the twentieth century American painter Larry Rivers used it successfully. Leonardo relied on a description of encaustic written, not by a fellow painter, but by a writer and historian, the trustworthiness of which any artist would treat with caution as a source. In addition, his amanuensis, Pliny the Elder's Natural History, was by then already fifteen hundred years old. The difficulty of following instructions in Mrs Beeton's Book of Household Management pales by comparison. azure. Musée du Louvre, Paris. Some research shows that ancient Pompeian fresco painters adopted the practice of applying wax to their frescos to give a luminous and matt effect to the surface. The artists heated the wax layer until it penetrated and bonded with the colours. Afterwards, he buffed and polished the fresco until it attained the required appearance. It would appear from his writings that this effect is what Leonardo da Vinci was trying to achieve in his experiment. Despite much research and many trials, the technique that Leonardo adopted was not a success. It was necessary to heat the wall after he had painted on it and apply the wax in order to stabilise the colours to fix them permanently to the wall. He managed to achieve this on the lower levels by heating the wall with wood burning cauldrons but the heat was unable to reach the higher levels. The unheated colours leached and spread into each other. Today the artist could have succeeded in his intentions by using a paint or hair dryer. Having previously taken the precaution of being paid in advance for materials, scaffolding, preliminary studies and large full-size paper drawings (cartoons) necessary to transfer the designs to the wall the artist cut his losses and abandoned the project in December 1503. In the centuries following Leonardo da Vinci, painters experimented with new or unusual techniques, mostly with disastrous results. 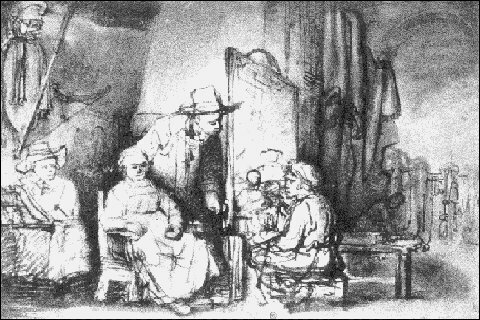 Eighteen-century artists went through a Rembrandtesque phase attracted by the dark mysterious golden-brown effects that the Dutch master utilised in his later years. Artists like Sir Joshua Reynolds and John Hoppner discovered that a timesaving method to achieve the same effect was to use the recently introduced beautiful dark brown pigment asphaltum. This was made, grinding up the remains of Egyptian mummies, or using the natural pigment itself. 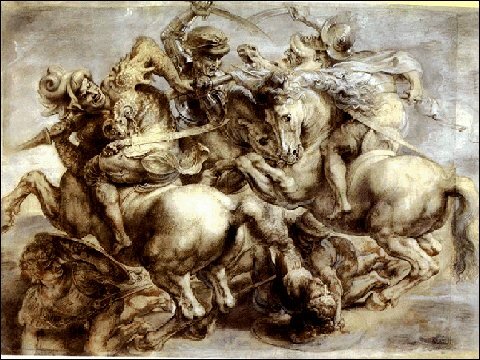 Artists eventually discovered that the colour, being ordinary bitumen, never actually hardened and, like Leonardo’s, the Battle of Anghiari, melted on the canvas taking the other more stable colours with it. Bitumen destroyed, over time, many beautiful eighteenth-century British portrait paintings. For present-day painters, artists’ materials are prepared industrially and commercially. For all their merits and despite their shortcomings, they have replaced the young apprentice in the studio grinding colours for the Old Master.